The Patriot League featured a great race for the conference title, with Lehigh finishing in first place, just one game ahead of Bucknell and two ahead of Lafayette. Lehigh and Bucknell faced off in the next-to-last game of the season, with Lehigh winning by 22 to essentially take the league championship. Lafayette was in the mix at the midway point, but went on to lose five of its last eight games to drop to third. Lehigh had no trouble in the conference tournament, winning three games by nearly 19 points per game. After taking an early lead and hanging in for about a half, the Mountain Hawks would falter in the second half against Kansas in the NCAA Tournament. There is no clear favorite this season, so we might be headed for another photo finish. 1. Lafayette: The Leopards finished last season on a high note, and return a highly-productive trio in Jared Mintz, Ryan Willen and Jim Mower. 2. American: Everyone of note returns for the Eagles, who also add transfers Troy Brewer (Georgia) and Charles Hinkle (Vanderbilt). 3. Bucknell: The Bison were playing their best basketball towards the end of the season, and return four starters. Mike Muscala is ready to break out. 4. Holy Cross: The Crusaders return five double-figure scorers from last season, but they struggled defensively and ended up in 7th place. 5. 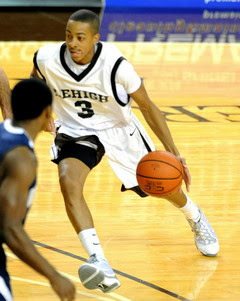 Lehigh: The defending champs have the league’s best player in C.J. McCollum, but they have to replace three starters. Who will emerge? 6. Navy: The Midshipmen lose the league’s top scorer, Chris Harris, but do bring back Jordan Sugars, who can fill it up and really rebound. 7. Colgate: The Raiders are a young team this season, and lose all-league performer Kyle Roemer. Forward Yaw Gyawu will try to fill the void. 8. Army: The Black Knights lose four starters from a team that finished in last place a season ago. Defense will again lead the way for Army.